The buzzing, tropical city of Cairns seems to become more popular year on year, with tourists arriving in their droves to soak up the sun on the region's endless beaches. 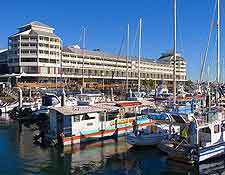 Cairns is also an important tourism gateway to both the Daintree Rainforest and the famous Great Barrier Reef, with regular scuba diving and snorkelling cruises departing from the harbour all through the year. 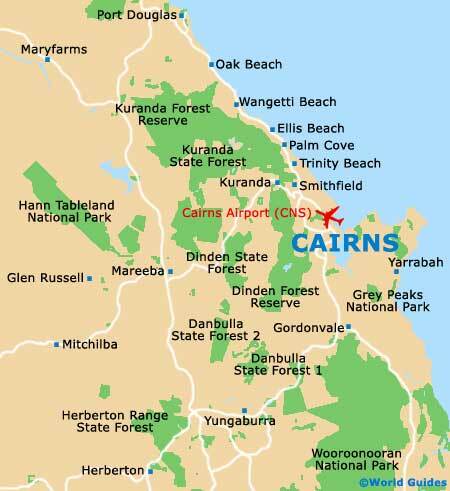 In fact, tourism in Cairns has become so important that this region now ranks as the fourth-most visited destination in the whole of Australia, after the cities of Brisbane, Melbourne and Sydney. The Pier Marketplace forms the heart of 'New Cairns', with this part of the city being revitalised in 2003 at the cost of more than $40 million, when the neighbouring mudflats were transformed into an enticing swimming lagoon and esplanade. Located next to the Foreshore Promenade, tourist information is available at the Tourism Tropical North Queensland office, which is run by the local government and is therefore happy to offer independent advice. 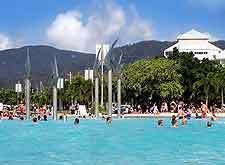 Many quality tourist attractions are spread around the Cairns area, and in the city itself, visitors and locals alike are drawn to the man-made lagoon, which comes with its own sandy beach, picnic tables and barbecue facilities. Families will also appreciate spending time at the Cairns Tropical Zoo, where friendly kangaroos, koalas, Rainbow lorikeets and cuddly wombats await. Native fauna is also housed at the Pier Marketplace's Undersea World, and at the Cairns Wildlife Dome - which resides at the very top of the Reef Hotel Casino. For wonderful panoramas of the surrounding countryside, take a trip on the Kuranda Skyrail Rainforest Cableway, where cable cars glide just about the forest canopy and boast the best views imaginable. The Kuranda Scenic Railway is also extremely popular and transports passengers past many impressive attractions, such as the Barron Gorge National Park and also the Macalister Range. 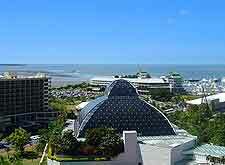 More information about Cairns Tourist Attractions. Beach-goers holidaying in Cairns will discover a wealth of sandy stretches to choose between, on both the northern and southern side of the city. Machan's Beach is particularly close-by and provides an undeveloped space to sunbathe, while Holloways Beach is more commercial, featuring apartments, water sports, a swimming pool and restaurant. Located next to Holloways, Yorkey's Knob is the place to come for wind surfing and kite surfing alike, and is conveniently close to the Tjapukai Aboriginal Cultural Park. Other leading beaches close to Cairns include Clifton, Ellis, Kewarra, Trinity and also Palm Cove, where resort-style hotels and cruises to the Great Barrier Reef serve as tourist magnets. 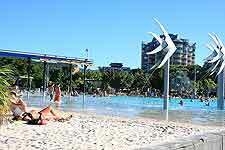 More information about Cairns Beaches. There is a small selection of museums to hand in Cairns, suiting those wishing to learn more about the town and its interesting past. Situated on the corner of Lake Street and Shields Street, the Cairns Historical Society Museum should be your first port of call and is also a good place to purchase a variety of Aboriginal souvenirs. Equally appealing is the Ben Cropp Shipwreck Museum at the Pier Marketplace, which documents the local sailing heritage and subsequent shipwrecks around the coastline. For art works, the Cairns Regional Gallery on Abbott Street has become highly regarded for its indigenous creations, housed within a classical heritage building. 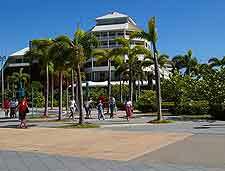 More information about Cairns Museums and Cairns Art Galleries. 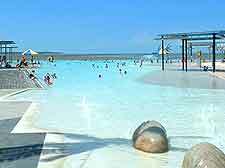 Far North Queensland is brimming with tourist attractions suitable for day trips, with some of the most popular excursions including tours to the Undara Volcanic National Park, where the Undara Lava Tubes are very memorable. Many visitors also choose to take a cruise to Green Island, Fitzroy Island or the Frankland Islands National Park, each of which features beautiful beaches and superb scuba diving possibilities. Tourists may like to drive to the coffee plantations of Mareeba, the waterfalls within the Atherton Tableland, the Mossman Gorge and the Daintree National Park. The town of Port Douglas is especially close by and is best known for its esteemed Four Mile Beach, with other highlights here including the Flagstaff Hill Lighthouse and the vibrant Waterfront Precinct. More information about Cairns Attractions Nearby.